Mecanum Mixer for Cheap & Dirty RCU - AndyMark Inc. The RobotLogic Mecanum mixer allows for simple RC-control of a mecanum drive robot. 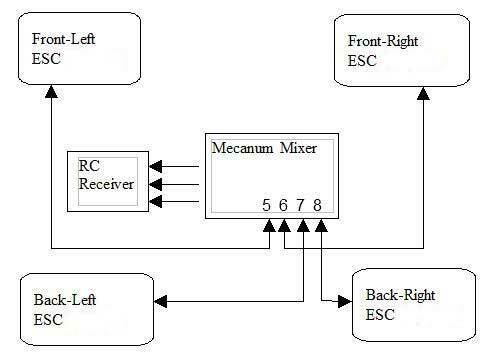 The Mecanum mixer is plugged into a standard RC receiver using three input channels. Four motor speed controllers are then plugged into the mecanum mixer. The driver can then use any combination of fwd-reverse, leftright, and sideways translation commands to control the robot. This is specifically designed to work with our Cheap & Dirty Controls out of the box with no need to reprogram. This Rev B design is more compact and efficient! This RC mixer is designed for four wheeled mecanum robots. It mixes three input RC channels: x, y, and spin to generate the appropriate signals for motors controlling four mecanum wheels. Add a heading hold gyro to your steering input for even more control! Arrived on time, exactly as advertised. Purchased for an off-season study project into the mecanum-drive arrangement.